created by Stan Lee and Don Heck. A Qoute-Fascinating, I could make a bundle on the manufacturing rights alone, assuming we survive this war. Blaster: 3D+2, (SP) Repulsors:7D+2, Dodge 6D, Armor Weapons: 7D, Missile weapons: 6D+2, Running: 4D. This armor is a specially constructed power armor that has a sealed environment for the wearer and provides a host of built in weaponry, sensor and flight capabilities for Tony Stark's personal use. The armor has a two hour air supply and provides the following benefits and gadgets with an eight hour power supply, once the armor is out of power it takes another 8 hours to recharge it. The armor itself provides +4D vs. Physical and +3D vs. Energy and should be considered Starfighter scale for the purposes of resisting damage. It has a 2D personal shield generator that can be brought online for 5 rounds before it has shut down to prevent the armor for overheating. This is a chest mounted laser and optional light source. Ironman can vent the repulsors through the chest light and attack that way if need be. The light source coming from the unibeam has a 50M range. Mechanisms within the helmet may project an omni-directional high-frequency sound wave in a 25m radius. Damage: 6D / 5D / 4D, Range: 0-5 / 15 / 25. This weapon causes stun damage only and can only be employed once during a combat setting. Fitted into the boots of this power armor are powerful repulsor jets that allow flight in the way that repulsor vehicles do. The armor, because of the sealed environment, can survive in the rigors of space and the depths of the oceans. and still function allowing movement speeds of Space: 7, Atmosphere: 400; 1150 kmh. With the current power supply of the armor Ironman has flight capabilities for 8 hours. Foam sprayer contained within the armor reduces fire and It will eliminate fires altogether. The range of fire extinguisher is 5M. The armor can be hooked up to an outside power source if need be, this is done by making an Power Armor repair roll (Difficult) and once done the incoming energy can be used to power the armor or weapons. Vital signs detector which may be keyed to specific individuals in advance via comlink. Range of 1 km. Macrobinoculars / Nightvision capabilities: They provide computer enhanced images, providing information on range and targeting. They have zoom capability. All Perception/ search oriented skills are increased by 3D when using these tools to view areas more than 100 meters away (normal modifiers apply). As they work in conjunction with the repulsors via certain programming software, they provide a +3D bonus to all medium and long-range shots (they are ineffectual for short and point-blank range shots). In the dark It allows a shooter to see up to 150 meters and reduce one level of difficulty per range. Exotic energy detector, capable of detecting odd or unusual radiation, range of 1.5 km. AM/FM, short wave, civilian, and navigation bands may be monitored through the helmet. 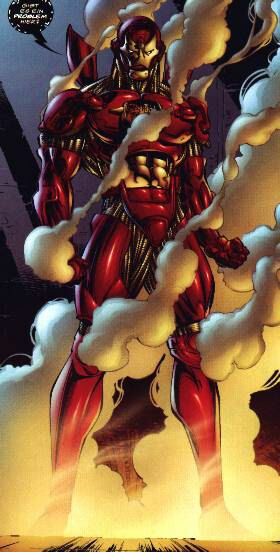 The armor receives its own wavelength and those of defense organizations, including S.H.l.E.L.D. It may also tie in with satellite and computer networks. It has emergency beeper. Range on all of above is 200 km as per a ship based comlink. Polarized eye shields installed in the helmet drop into place to protect the wearer from being blinded by bright lights and give an additional +1D to stamina rolls to resist being blind. Tony Stark -- brilliant industrialist, inventor and CEO of Stark Industries, a weapons and munitions enterprise -- was struck in the chest by shrapnel while tending to business interests abroad. Wounded, he was taken prisoner by the Asian warlord Wong Chu and coerced into developing a powerful weapon in exchange for an operation that would save his life. Instead, Stark erected a small laboratory with the help of fellow prisoner Ho Yinsen and realized the latter's design for an electrically powered, transistorized suit of iron armor equipped with heavy weaponry. Transformed thereafter into the invincible Iron Man, Stark defeated his captors. Having won his freedom, he went on the offensive -- exposing spies, bringing criminals to justice and opposing any individual or force representing a danger to national security. Stark was instrumental in establishing S.H.I.E.L.D. -- the Strategic Hazard Intervention Espionage Logistics Directorate, a worldwide intelligence and peacekeeping organization -- while Iron Man became a founding member of the Avengers, Earth's Mightiest Heroes. All the while, Stark was required to wear the armor's chest-plate to keep the shrapnel from stopping his heart. Wishing to retain a certain degree of anonymity, Stark devised a cover story that cast Iron Man as his paid bodyguard. Initially, he donned the armor solely to battle criminals who threatened Stark Industries. Stark matured into a true champion only when he realized his creation could serve the greater good. Since shedding his selfish preoccupation with the protection of his own interests, he has battled numerous foes as Iron Man -- including the Mandarin, the Iron Monger and Whiplash. But Stark's greatest nemesis has been alcoholism. A threatened takeover of Stark Industries, compounded by personal problems, led him to seek solace in a bottle. Although Stark managed to recover quickly from his first serious bout with alcohol abuse, the compulsion to drink remains a constant temptation. A new medical problem arose when Stark was fitted with an artificial heart, which must be recharged regularly when he is out of his armor.